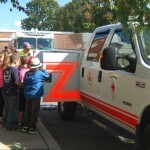 Students at Pequea Elementary spent part of this week learning about National Fire Prevention Week. At the end of the week, the school held a fire drill with the West Willow Fire Department responding. After searching the school for possible fire hazards (and finding none!) 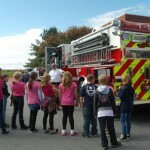 the firemen showed the students around the fire truck and emergency vehicle explaining how they fight a fire and describing the function for different pieces of equipment.